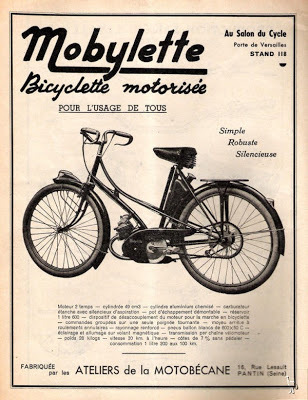 In the early 1920’s Frenchmen Charles Benoit and Abel Bardin worked together at the Pantin based company SICAM (Société Industrielle de Construction d’Automobiles et de Moteurs) developing a small two-stroke auxiliary motor that could be attached to bicycles. 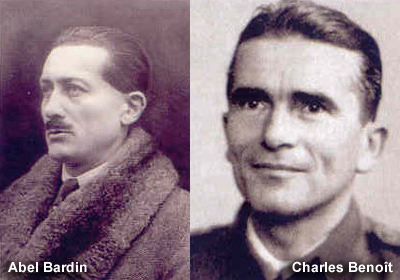 Intending to adapt the engine for use in a “voiturette” (little car), Benoit and Bardin left SICAM in 1922 to found their own company. 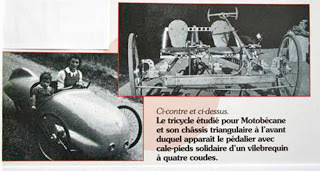 Unfortunately their first prototype, the Pélican, (later described as a “cyclecar”) caught fire and the men were forced to abandon the project. Instead they set to work designing a motorcycle. 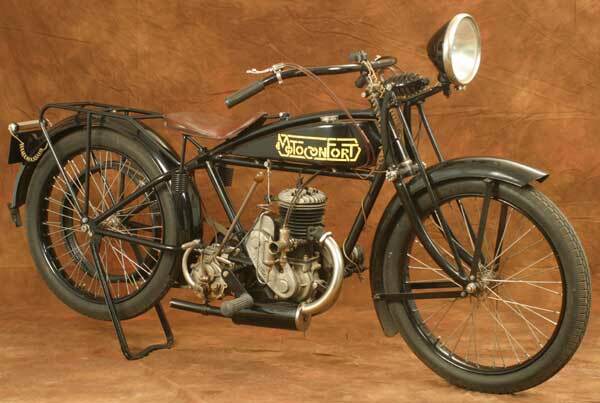 In 1923 they completed a new prototype featuring a single-cylinder, two-stroke 175cc engine, and this time the test runs were much more successful. 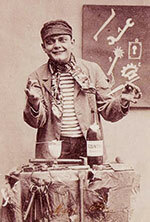 In 1924 Benoit and Bardin, joined by several others, founded a new company: Société des Ateliers de la Motobécane. The 175cc motorcycle was dubbed the MB1 and held the company’s first patent for a piston design that delivered greater power over similarly classed engines. Motobécane launched full production of the MB1 from a small 400-square-meter factory in Pantin, and it quickly became a bestseller in the entry-level range. 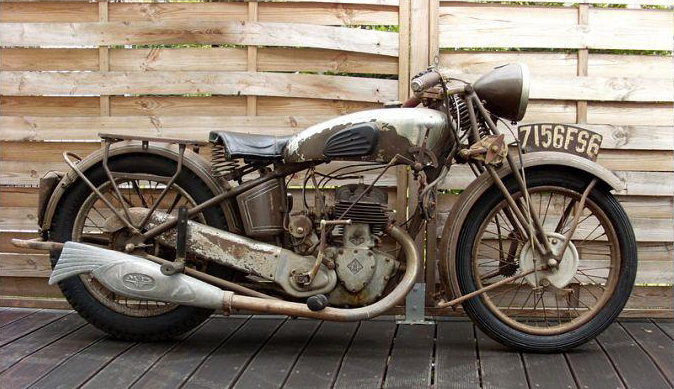 By the end of the decade Motobécane had become one of the best-known names in the French motorcycle market. In order to meet production demand the company launched an expansion of its production facilities, adding more than 6,000 square meters by 1926. They continued to improve on the MB1 design through the end of the decade, adding a number of new features such as a luggage rack and a muffler along with various engine improvements. 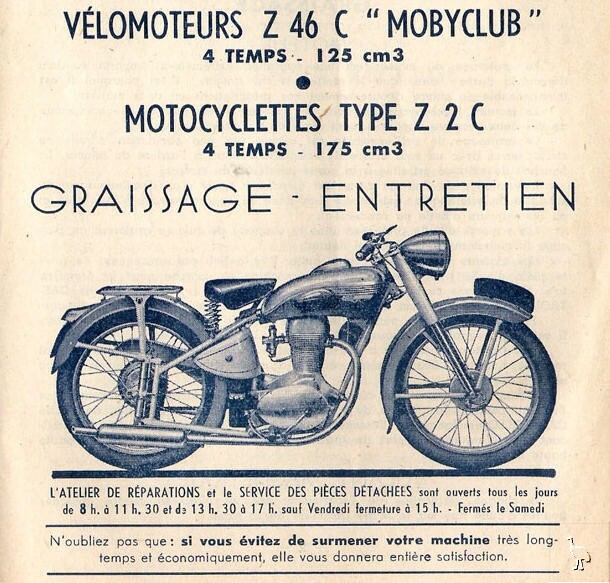 The MB1 was to remain a fixture in Motobécane’s catalog through the 1930s, but in the meantime the company continued to expand its range; in 1926 they developed a 308cc motorcycle also featuring a single-cylinder two-stroke engine, the “Motoconfort” which quickly provided the company with its second success. 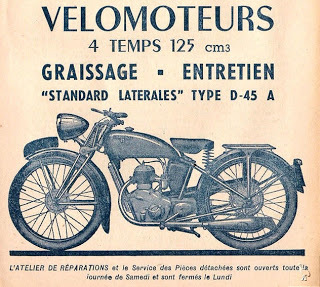 Motobécane began developing its first four-stroke engines in the late 1920s, and their early efforts produced a 500cc engine in 1929 but the design generated little more power than the company’s two-stroke engines and it failed to garner much attention. 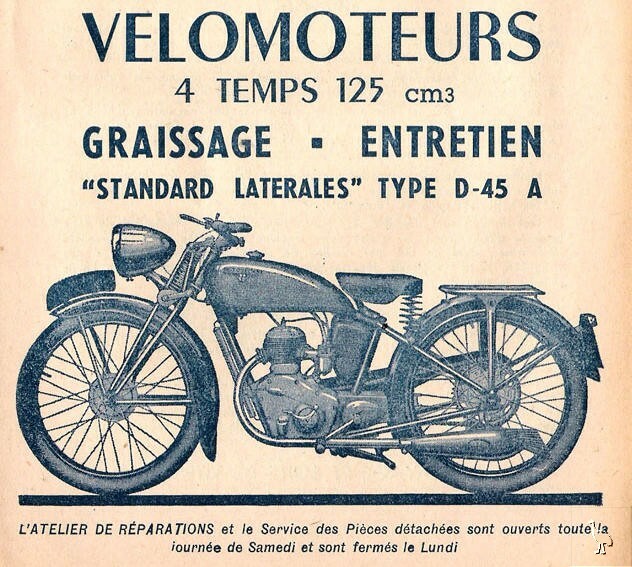 Still, by the 1930s Motobécane was producing a best-selling range of motorcycles and they continued to push the four stroke. In 1930 they launched the B7, a 750cc four-stroke motorcycle which delivered greater power but still failed commercially. 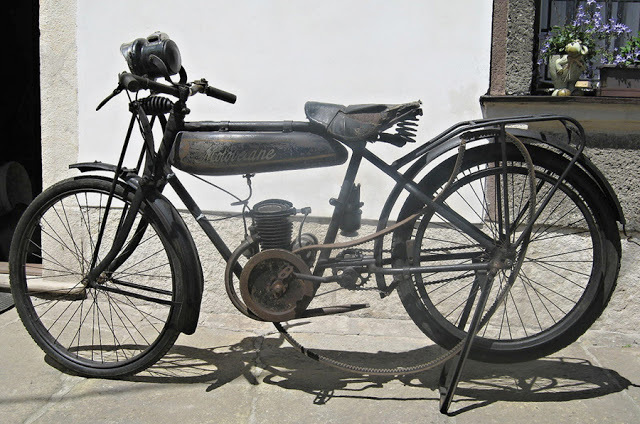 1933 saw the introduction of a new 250cc model and by the end of that decade the four-stroke featured prominently among the group’s models although two-stroke engines remained the primary focus of production, particularly the small-cylinder models. 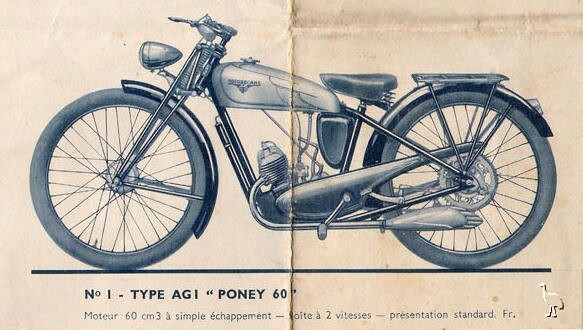 These included the Poney, introduced in 1938 initially with a 63cc engine that was replaced in 1945 with a smaller 50cc design. During this period the firm entered several road racing competitions and won the Bol d’or endurance race. With the onset of the French Occupation during World War II operations at the Pantin factory were severely restricted. Although a few Poneys and B1V2 machines initially crept off the lines, lack of materials soon put a halt to production and in 1941 the Organizing Committee of the Automobile (COA) issued an order allowing only the manufacture of bicycles for civilians. 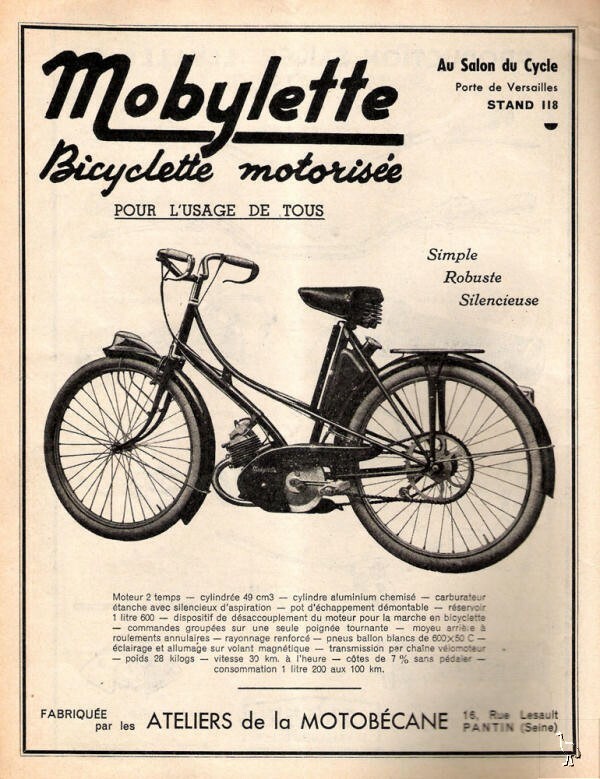 Motobécane adapted their facilities and came out with three standard bicycle models, two basic and another designed for racing; they also produced some twin cylinder, water cooled engines for bauer Karlsruhe fire pumps and worked on designs for radial aircraft engines. 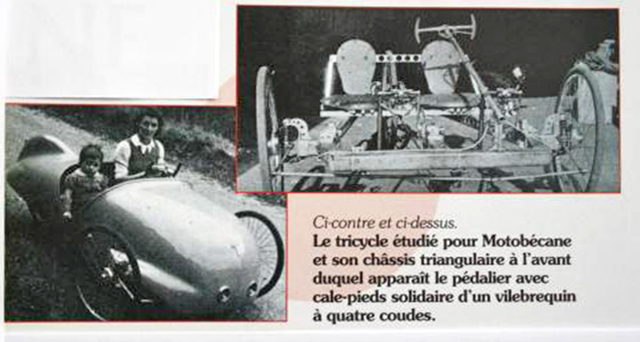 In response to disappearing civilian fuel supplies, the directors instructed engineer Éric Jaulmes to look into producing a pedal car to compete with the Vélocar: in 1942 he delivered a prototype three wheel vehicle with pedals connected to the single rear wheel via a chain and an 8-speed cycle-style gear system. The emphasis was on weight reduction and it came in just over 30 kg. A single central fin on the tail-piece of the body was featured not for aerodynamic reasons but in order to accommodate the rear wheel. The vehicle never saw production, and seems to have been more of an exercise in morale building rather than a practical commercial concept. Immediately following the war the company sought to continue its push into larger motorcycle categories, and began designing a new two-cylinder four-stroke engine. 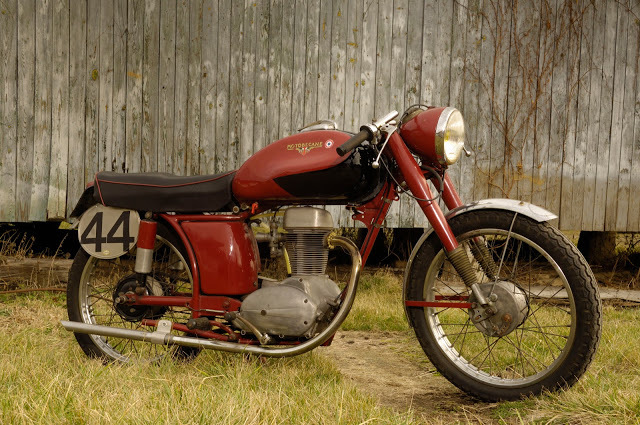 A prototype of the new model dubbed the V4C was displayed in 1947 but lack of demand for larger motorcycles caused them to abandon plans for further development. Instead they went back to focus on smaller single cylinders: their D45 125cc had been introduced in 1945 and had proved a commercial success, as had its successor the 175cc Z46 which was equipped with modern suspension. Based on the success of its smaller motorcycles, the company introduced a new design in 1949 that was to become its greatest commercial achievement. 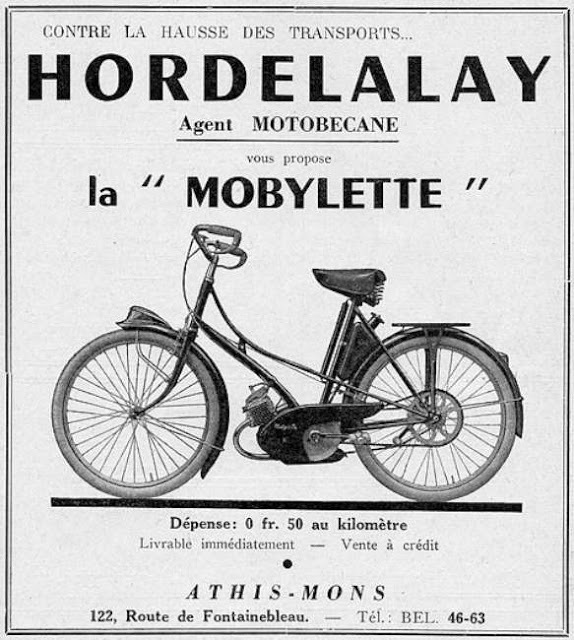 The Mobylette, as the new model was called, was a hybrid between a bicycle and a motorcycle and it responded perfectly to the needs of the postwar French population; with few automobiles available for private use, the country’s workers typically traveled to and from their homes on bicycle. Charles Benoit had been exploring the concept of the auxiliary bicycle motors he had produced at SICAM earlier in the century: as early as 1942 Motobécane had developed the AV2 motor which was intended as an add-on for a bicycle. 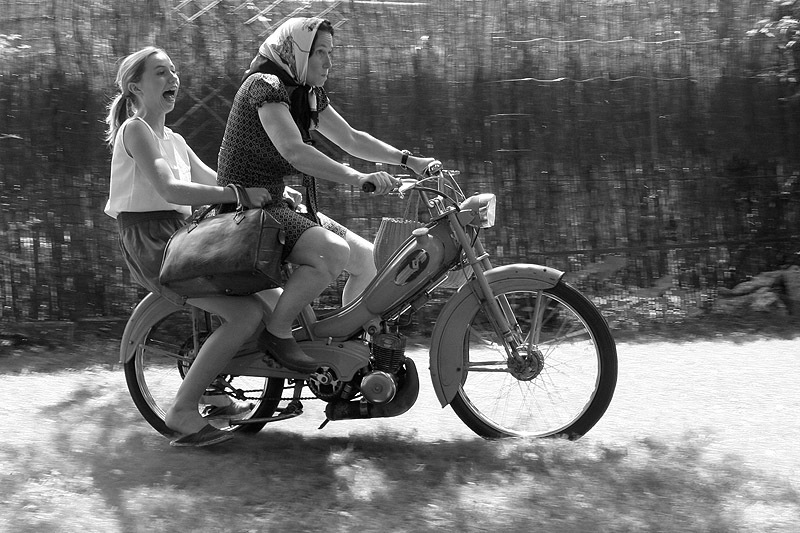 When the Solex company, an established manufacturer of carburetors and other automotive parts, released their Velosolex motor powered bicycle in 1946 at the Paris Salon their success convinced Benoit that the time was right. 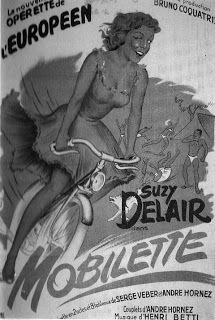 Motobécane reinforced a bicycle frame and adapted it to accept their Poney motors: the result was dubbed the Mobylette AV3, and was launched in 1949 under both the Motobécane and Motoconfort names. 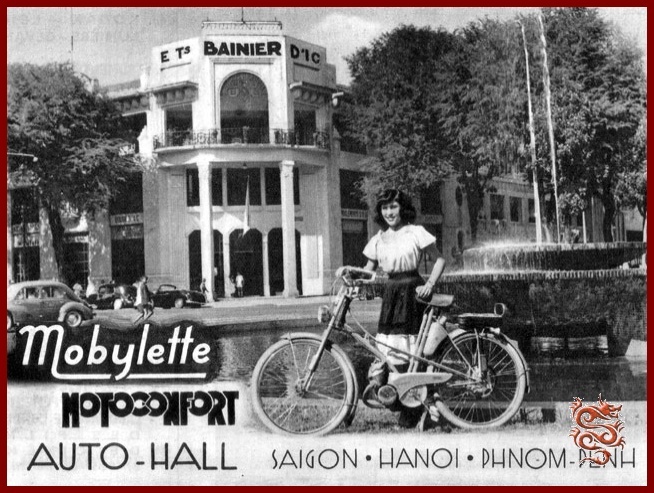 The Mobylette featured several innovations that provided an advantage over the Velosolex and other competing models; the design utilized a low-slung frame appropriate for both male and female riders, and the company had also designed the fuel reserve and engine to eliminate the risk of oil or petrol spattered clothing. Motobécane had also equipped their hybrid with a wide, comfortable seat, raised handlebars and a headlamp: small touches that immediately appealed to their customers. And despite the motor’s small size and limited performance (top speed was only 30 kilometers an hour) the Mobylette was capable of climbing all but the steepest hills. 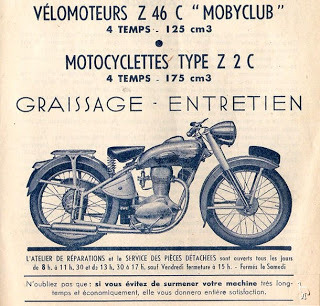 The success of the “Moby” was immediate, and Motobécane rapidly grew from a relatively small company focused primarily on the French market to an highly internationally recognized brand. But as demand grew steadily through the 1950s it quickly eclipsed the company’s motorcycle production capabilities. 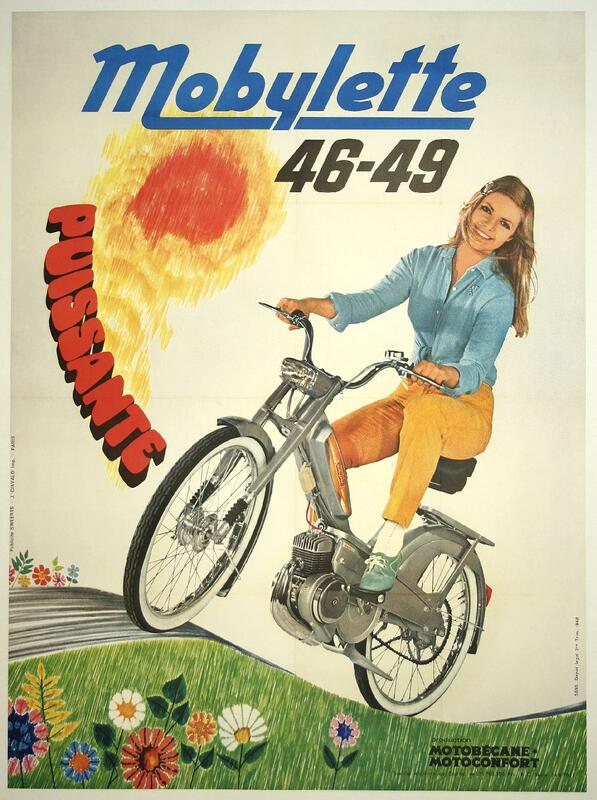 By 1964 the company had produced its last “real” motorcycle and was focused almost exclusively on the little moped. Sales of the Mobylette remained strong and the company continued to expand its range adding new models, colors and features. 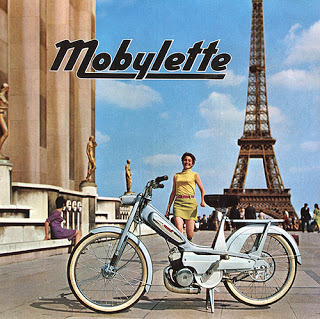 Altogether the company sold more than 14 million Mobylettes, becoming the leading producer in its class: the model’s popularity was such that “Mobylette” had become a generic term for what we now know as the “moped”. But by the late 1960s the market for the Mobylette had begun to decline. 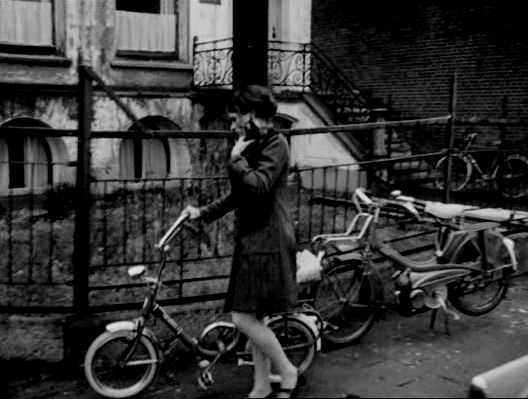 Steady economic prosperity meant that the public could now replace their economical transport with more comfortable automobiles and larger motorcycles: at the same time a rise in popularity of the new Italian “scooters” which featured more power and a more modern design was posing a new threat to Motobécane’s core market. During the 1970s several variations were available, usually incorporating a number/letter combination such as 40T, 40TL, 40V, and 50V. These naming conventions determined either stock or optional equipment available; for example, the 40T was a slower version capable of just 25mph maximum speed and without rear suspension, while the top of the line 50V had front and rear suspension, a heavier body, and was capable of 30 to 35 miles per hour (48 to 56 km/h). 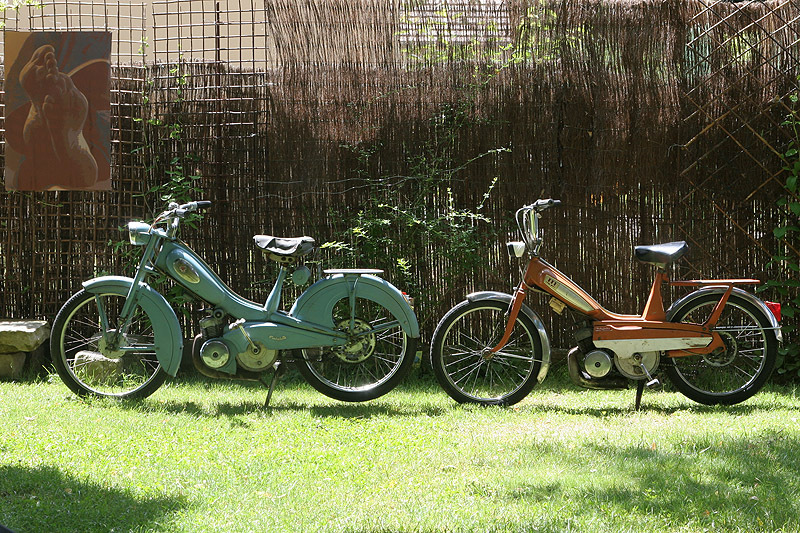 In response to slumping sales, Motobécane launched a new attempt to reenter the full-size motorcycle market, introducing a new 125cc model in 1969; but the rapid growth of imports from the major Japanese motorcycle makers made it almost impossible. They tried again in 1973 with a well received 350cc three-cylinder model, but by then the advanced features had raised its base price too high to compete against its lower-priced Japanese competition. Another factor led to the group’s downfall; with the rising popularity of televised racing by the end of the 1970s, racing had become an important means of promoting motorcycle brands. Although Canadian Walter Muma rode a 50V 11,500 miles on a 3-month round trip from Toronto to Alaska in 1978 and Motobécane had developed its own racing team in the late 1970s -competing in several Grand Prix races, even managing to score a number of 125cc class victories in the early 1980’s- they had done it with motorcycles that bore little resemblance to their production models. 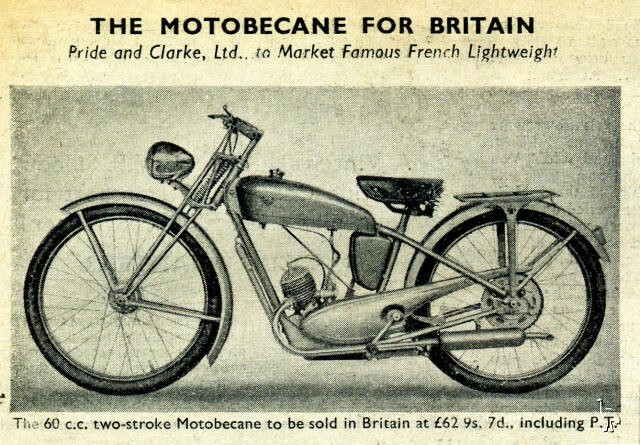 The interest in racing and consumer machines had merged and the public wanted bikes that were fast in their stock form.Motobécane continued to explore new engine and component designs, launching a collaboration with Bosch to develop a fuel-injection system for two-stroke engines but that project failed to produce results. After a failed attempt to merge with Italy’s Motoguzzi the company was forced to declare bankruptcy in 1981. In India, the earlier version of Mobylette was manufactured under license by Mopeds India Ltd from 1965 until the late 1980s under the name Suvega. They also had a factory-supported race team which was highly successful in annual Sholavaram races in 50 cubic centimetres (3.1 cu in) class. In 1983 Motobécane was sold to a group of buyers led by Xavier Maugendre, a prominent figure in France’s automotive and motorcycle markets. Renamed as MBK, the company began seeking new investors in order to rebuild its operations and by 1984 they had secured financing from new shareholders included Yamaha Motor Company which acquired 40 percent. 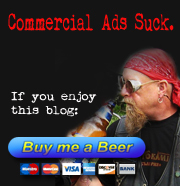 By 1986 Yamaha had gained majority control of MBK. Under Yamaha’s ownership MBK was able to return to profitability, achieved in part through the transfer of parts of Yamaha’s scooter production to MBK’s factory. But although some of the company’s production was sold under the Yamaha name they continued to market several models under their own MBK brand including the “Booster” scooter line launched in 1990. MBK continued to produce the Mobylette through much of the 1990s. From its launch in 1949 until final production in 1997, the Mobylette acheived production numbers exceeding 14 million with peak production in the 1970s averaging around 750,000 annually. 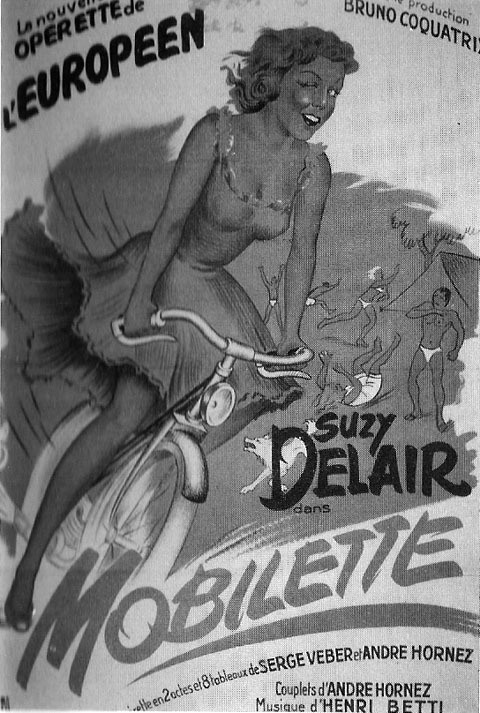 The company also continued to produce bicycles on a small scale, although the Motobécane brand was later sold to a U.S. company which used it to market Chinese and Korean built bicycles. Early in the first decade of the 21st century MBK also began producing motorcycles again, including a 600cc motorcycle for Yamaha starting in 2003. But scooters remained MBK’s core operation into the second half of the decade; the scooter’s economic and environmental advantages was winning over a growing number of urban commuters. MBK launched its first large-wheel scooter, the Cityliner, for the 2008 model year. Under the name MBK, the company continues to manufacture scooters and mopeds for the European market.